Sugar and honey for Serious Wounds? “Surviving the Economic Collapse” Book sold at the Expo? Several have asked if I would be selling my book at the Self Reliance Expo in Salt Lake City on Oct 7th and 8th. Unfortunately no, I’m just staying in USA for the duration of the expo, traveling very light, so its just too much trouble to go around with boxes full of books and even worse, fly back to Buenos Aires dragging books around through airports for 24 hs! I’d be more than happy to meet all of you who can attend and sign copies of my book. If you’d like to get a copy, try checking on Amazon and see if you can get it delivered to your location before Oct. 8th. I’ll be at the Expo both days. Take care and see you at the Expo next week! Some tools you just like right from the moment you see them. When that happens, its usually because the design is appealing to you in some way, and nothing appeals to me as functionality. As soon as I saw the Boker Vox Access tool I liked the design and ordered one. Its not a pretentious tool, just a well made pocket prybar, glass breaker and bottle opener. The general geometry just made sense, so I wasn’t surprised when I learned it was designed by a known knife maker, Jesper Voxnæs from Denmark. The classy lines, elegant silhouette, its just nice when you have a product like that. Its made of titanium with a carbide glass breaker protected by a couple of o-rings. In terms of functionality and quoting Louis Sullivan, you could say form follows function. Prybar? Check. Nail puller? Check. Bottle opener? Check. Glass Breaker? Check. Then again its all that and a bit more. You can also use it as an improvised medium flat screwdriver and as that general scrapping/poking/picking general use tool. I’ve had the Boker Vox Access tool for about a month now, carrying it in my keychain with a paracord loop. This gives me seven 10 inch strands of cord once gutted so the cord loop is useful on its own. Though I haven’t used the glass breaker, I have no doubt it would work in spite of doing so with some difficulty given the small size and sub-ounce weight. I’m not decided yet regarding permanently adding this tool or not to my already hefty keychain. So far its not too cumbersome, it has done its job as a bottle opener and is pleasant to use as a mini prybar. Until now the only neat choices in mini prybars was the ones made by Peter Atwood. Beautiful work, but sometimes costing hundreds of dollars. Shrade makes a titanium pry tool, but to me it seems more crude, bulky and less stylish in comparison. If you’re looking for a compact pocket prybar/bottle opener/scrapping/poking thingy, the Boker Vox Access may be what you are looking for and is great value for about eighteen bucks. I just received your book yesterday and have gotten through half of it so far. I’m happy that you did the book in that it is of your own experience from a recent economic collapse, realistic, and straight to the point. I have been trying to get prepared with the more common items to survive at a minimum, very high prices for everything, but some of the lists have so much that it made my head spin trying to figure out what my family really needs. Not having an endless supply of money to spend either, I have to prioritize what I buy. In reading about the 2 liter bottles for water storage, I don’t drink soda, but was wondering if the 16oz water bottles would be good for water storage also? The thing I am worried about it how thin the plastic is compared to a bottle of Gatorade or soda. Do you think these bottles could work for any length of time? Hi Michael, thanks for your email. Which bottles would those 16oz ones be? If they are store bought water bottles, then they will be good for a year, maybe two. Water wont go bad but it will taste like plastic. While MUCH better than not having water at all, you can avoid that by rotating once a year and keeping it stored in a cool, dark place. To be sure how good or bad a bottle may be you have to learn a bit about plastics. They will have a triangle in the bottom with a number inside. That number is the type of plastic you have. Check the wiki link to learn some about this. The bottles to avoid would be the ones used for milk. In some cases these degrade fast and will quickly start breaking and leaking. Numbers 2 HDPE (high density polyethylene), 4 LDPE (low density polyethylene), or 5 PP (polypropylene) are good options. Number 1 is PET, and mostly ok for one time use though you can get away with reusing it once or twice if needed. Keep in mind that some HDPE plastics are not “food grade”. The best way to know if the plastic is food grade or not is by using containers that already were sold for such purpose or already contain food. If possible get BPA-free bottles. Don’t reuse containers that have been used to store fuels or chemicals. Remember to throw four or five bottles in the fridge. If the power goes down you can use them to keep your food cool for another couple of days. Simply place your food among the frozen bottles at the bottom of the fridge and cover with either plastic sheathing or several plastic bags for insulation. The class lasted from 9am to 6pm with a 30 minute lunch break right there in the range. About 400 rounds were fired during the morning and in the afternoon we used airsoft Glock replicas and revolvers loaded with wax projectiles (those DO hurt). There were twenty people in the class, over half of them police officers, mostly GEOF G.E.1 (Federal Special Operations Group, something like a Federal police SWAT) and the rest were non law enforcement, of which nearly all of us except maybe two or three were firearms instructors. You could tell right away the general level was pretty good. People would draw and shoot with acceptable speed and accuracy, same for reloads. No one needed to be explained what a tactical or a fast reload was, or how to clear a malfunction. This of course makes for a faster paced class and you make much better use of the time you have. The class started with a small introduction by instructor Jorge Baigorria. There was no shouting, no bravado. Almost whispering he mentioned several recent incidents, where the techniques about to be taught have saved lives. He also mentioned the recent murder of Hernan, how a fighter´s heart makes you keep fighting even when mortally wounded. During the class yes, you where shouted at, kicked and pushed so as to add some stress to certain situations. Credentials of the instructors where not needed, especially since the important credentials in this sort of thing are the ones you don’t brag about nor do you put them in any CV or bio. No one there, students or instructors need to prove anything. We were all there to learn and improve ourselves as gunfighters. Maybe what I noticed the most was the down to Earth level of the conversation, how urgent it felt to be ready to handle violence that was already there, already in our lives and all around us. Bad guys don’t just rob, they kill you like a dog without remorse and given the current politics and lack of space in Argentine prisons they just walk. We weren’t training for some nut shooter in a mall or a terrorist, but the bastards already waiting right outside the club as we trained there, the ones waiting for you in the corner of your block. Several of the attendants have been involved in gunfights and had been wounded. What we were training for wasn’t something unlikely to happen. Quite the contrary, it was something that had already saved lives of those attending and could save any of us again in the future. We started drawing and shooting (carrying concealed) 12, 3, 6 and 9 o’clock. Then we shot while moving diagonally back and forth. When you ran out of ammo you just reloaded and placed another 2 shots on target for good measure. We practiced the more typical close range drills, then from “surrendered “ positions on your knees or face down on the floor. Another interesting exercise was running from a barrel to another and finding a gun in a box that could be in condition one, two, or three. You had to grab everything inside the box, your gun and one or two extra mags, maybe a folder as well and a flashlight, then run back to the first barrel and engage the enemy as best as you could, using cover, shooting a couple rounds then going back behind cover and shooting from the other side, standing or from the ground, that was left to your criteria. After lunch we used the air soft and wax ammo revolvers. We started with “suicides”, 1 vs 1 without moving, then moving, then 2 vs 1. After that we ran several real life scenarios, home invasions with a hostage family member, robbery at the bank, while buying a car, all cases that actually happened and using the transcript of the actual case. *Check your gear before going to the range. One police officer had this awful cheap soft IWB holster that collapsed without the gun. Its just impossible to keep up when its so hard to reholster. *If you can, wear body armor. Defensive shooting training is a high risk activity, make that advanced defensive shooting in all directions, while moving, with people left and right and it becomes a very high risk activity. Can you trust others with your life? Sometimes you have, but why risk it during training when you can wear armor? * I used a fullsize Glock .40, Wolf ammo, not a single malfunction. *Don’t waste your time and money and invest in a good pistol with quality ammo for these classes and for your defense. If its reloads, make sure they are good. Its not just about your time, if you experience problems with it you’ll waste other people’s time as well. *Water, extra ammo just in case, multitool, bug repellent, all that should be in your bag. A shemagh around your neck helps keep hot empties from going into your collar and down your shirt. *During force on force on force we saw how common it was to get hit in the hands and arms. Almost 50% of us got shot in the arms when using the air softs. Why? Because when you shoot your arms are naturally located in the center of your chest. When shooting single handed you still bring your left arm up to the chest. I got shot in my left arm doing just that. A shot there beats a direct hit in the chest! Practice “Making yourself small”, bring that other arm up when shooting single handed, covering your heart, cant the torso making yourself a smaller target. *Since the odds of getting shot in the arms/hands is so high either because of natural defensive stances or because you’re shooting, its very important to be proficient with your other hand, know how to draw, shoot and reload with your non dominant hand. *Just two guys got shot in the face. I’d say chances are 10% or less when the target isn’t just paper, but a live, moving and fighting person. This also means that body armor increases your chances of survival a lot. During high risk situations, BA is clearly worth it. *According to those that got shot in gunfights, they either felt nothing at all and only later realized they had been shot, or barely felt a sting or burn where shot. The bad guys didn’t fly through the sky when hit, they simply collapsed in place, forward or backward as if losing wind, making guttural sounds. *Reloading, tap-rack-bang, drawing fluidly, you have to practice all these to become proficient. It’s a perishable skill. *People do miss even when shooting at very close range, a guy dropped his gun during struggling. Things that happen that you don’t see when just punching paper. *One of the things that became obvious was that 6 shots is just too little when facing more than one attacker. *When surprised and caught off guard, we could see that its best to wait for the opportunity, a moment of distraction to shoot, grab the gun of your attacker, etc. Action beats reaction, but act with a plan anticipating your next move when there’s more than one attacker. *In many of the cases, you realized you often don’t know who the bad guys are. Yes the one with the gun pointed at you is clearly a bad guy, but what about the half a dozen people around you? Clients, innocent victims? Or accomplices that will shoot you in the back? Yes, that would be my ugly mug. For those of you that can make it, it would be a great opportunity to meet face to face, talk, debate, ask questions, etc. I’ll give a lecture each day of the Expo so if you have points you’d like me to cover this would be the time to make suggestions. After the lectures I’ll be there the rest of the day for those of you that want to talk more. Self Reliance Expo is the largest exposition on self reliance and Emergency Preparedness. I’m really looking forward to it. To those of you that can make it, see you in a few days! A friend of mine who suffered a bike accident is using common sugar for treating his injured foot. He still goes to the hospital, has the progress checked and dressings changed but he still does some of it at home, and the doctors indicated that he should use sugar on daily basis. We’re talking about a serious injury with significant loss of skin, flesh and tendon damage. My mother in law was indicated similar treatment after her breast cancer surgery, pouring sugar over the wound. I know its used at the Buenos Aires City zoo for animal wounds and that it has been used in battlefield wounds as well. 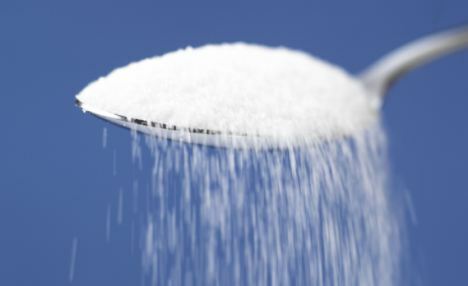 Sugar works as an effective antiseptic, in some cases it even works in cases where typical pharmaceutical antiseptics have failed. Honey is also used and is an old time remedy for insect bites. Sugar and honey not only works as an antiseptic, several studies have showed that it also reliefs pain and speeds up the healing process when compared to not using it. The way of using it is pretty straight forward. Clean up the wound with soap and water, dry so that there’s no moist the apply sugar directly into the wound. In some cases its recommended to first apply honey and then sugar so that it sticks. The people I know, they used sugar simply powered directly into the wound. The sugar crystals should go inside the wound when possible. After that, cover the wound with sterile dressing. Its surprising how effective such a simple remedy can be. Doing some google you’ll find out several studies and hospitals that have come to accept hoe effective it is. How real is the threat that martial law will occur in the US in the next 18 months? Is it your opinion that as a father my priorities should be? Hi Jeff, I cant say for sure but it is a possibility. I doubt its 50/50 but even if its 20%, which would be a reasonable yet conservative estimation, its still probable enough. Even more important, chances of sporadic violence, rioting and mobs (check the Flash mob posts) those are very real and already occur. These would be my priorities. 1) Using computer terms, update your own and your family’s “softaware”. For this you will have to assess your current status. How’s your spending? How’s your family budget and where could it be improved? Where does your family stand in terms of awareness and security? Are the wife/kids/yourself spoiled with habits that aren’t acceptable any more given current times? I make sure my kids get it even from an early age what the priorities are. For one, being spoiled brats is simply not acceptable, nor will it be ok for them to be spoiled teens. If that sounds a bit harsh keep in mind that after spoiled kids comes spoiled teens, and right after that come spoiled adults. We have enough of those as it is and I especially don’t want my own kids to suffer being one of them. This also involves something that scares the living heck out of most parents: Spending time with those little people you have living in your home! Parenthood is a responsibility, its about both money and time. Some parents throw money at the problems and hope that’s enough. It’s not. My priority now and always has been my family, and this should be taken into special consideration when preparing. Your family is your safety net, the core that will make all of you strong during tough times. Spend time with your family, wife, kids, make the effort to be as close to one another as possible. This point alone is huge and would require its own article but think about it from the preparedness perspective as well. Working out or practicing sports as a family, hiking, taking those moments to talk about attitudes towards problems, about coping with them and current events. Talk with them about security and crime, ask them what they think, what they’ve been seeing in school/work. Don’t just monologue, have them all talk about these topics. This is what I mean when I say “software”. The gear and stuff, guns, ammo, etc yes its important but not as much as what’s in your brain. 2) About the points you mentioned. I’d get a handgun if you don’t own one already. Get a revolver if your budget is really limited and you have little resources to gain the skills you need, otherwise a nice semi auto such as the Glock. A 6-shooter in 38special/357 magnum is light years ahead of being totally unarmed. Of what you have left, buy at least 2 months worth of food and plan on working up to 6 months. Two months worth of food stored sounds like a lot, right? It does if you don’t plan on eating by then. If you think about it that way two months, six or twelve is all very reasonable. A six month minimum goes according the following logic: First, you’ll be eating it anyway, that’s basic enough. Second, if you get fired from your job, given the situation today its possible that you may spend several months looking for a job. The last thing you need is worrying about putting food on the table. If there’s rioting and serious social unrest supermarkets may be closed or looted as well. This is why it makes sense to stock up on food and water. After you have a gun and two months worth of food, I’d keep the rest as emergency cash. If you cover two months worth of expenses in cash, then put the rest in precious metals. This will of course vary widely depending on how much money you’re talking about but this would be my generic recommendation. I work as an R.N. in both E.R. and I.C.U. settings. It constantly amazes (and frustrates doctors and nurses) that people are not accountable for their medical use. When some one has a chronic condition that they purposefully do not take care of or they have a problem that has been with them for awhile (time changes by medical condition) and just felt like coming in that day is hard for us to relate to. As relates to your writing please consider writing on subjects of how much can be taken care of at home with over the counter medications. Some days a full 1/3 of my patients could have avoided a hospital visit by staying well hydrated (and/or peeing often). This includes dehydration, kidney stones, urinary tract infections, and elevated blood sugar. Another good percentage could avoid being sick if they they just washed their hands. This includes flu, colds, pink eye, gastro-interitus, etc. You could give lots of good advice that keep people out of the poor house due to a normal $800 (min) cost of visit to the emergency department for those that actually pay. Good “talking” with you. Please keep up the increasingly professional work you are doing. Also, I did not write this for print, but you may paraphrase. Thank you. Hi Tom, thanks for your email. You bring up several interesting and valuable points. I did notice that as well, that a significant amount of medical complications either start or evolve into more serious ones because of the patient’s ignorance. Drinking lots of water: As Tom says, staying hydrated. To begin with, most people simply don’t drink enough water as it is. If urine isn’t clear, then you’re dehydrated to some degree. Drinking more water makes you feel better, think better and feel less hungry. People often confuse thirst with hunger. I found out that drinking a couple more liters a day than I normally would helps a lot to accelerate the flu process and reduce the sinuses inflammation and that puffy face feeling. Washing your hands: Did our grandparents know what they were talking about! Dirty hands when grabbing a quick bite may be one of the most common ways in which people catch bugs that they could have avoided, but its not only that, the average person touches his face three times every waking minute. Its impossible to know what critter came in contact that surface you are now touching or if a plumber just fixed one of the bathrooms in your office building and touched the elevator’s buttons. Wash your hands often, especially before eating and carry with you hand sanitizer for when soap and water aren’t available. Don’t self medicate! I admit that I take aspirin or ibuprofen when they situation call for it and that would be self medicating, but some people take it to dangerous levels. Aspirin during headaches is one thing, but popping sleeping pills, painkillers and other strong drugs all day can be dangerous. Its always better to check with a doctor, avoid self-diagnoses and if you do take medications on your own, stick to the ones you know well enough and are available across the counter. I’m surprised by the amount of people that will take very strong prescription medications for certain symptoms when there’s less risky options available. Go to the doctor: How simple can that be? But people will often wait, hoping problems will go away on its own or just ignore doctor’s recommendations all together. If something hurts, or if your body starts failing in some other way, then you need to know what’s going on. Problems rarely disappear on its own, rather they are symptoms of complications likely to get worse rather than better. Infections and wounds that haven’t been sanitized are a good example. I just talked with a friend over the phone that called after having some of his wound dressings replaced in the hospital (bike accident). These treatments can be very painful, but leaving them be can be dangerous since a spreading infection can end up in amputation or death. Ask for a second opinion: If you don’t like what a doctor tells you, there’s nothing wrong with getting a second opinion. If he says the same as the previous one you have a better idea of how accurate the first diagnose was, if not you may avoid problem. I’ve had doctors recommend surgery and treatments that weren’t really needed. I suppose it happened to others too. As with everything else, unscrupulous doctors will try to make the extra buck (or thousand) at your expenses. Tough economic times bring the worst out of people of all walks of life and this is no different. A second opinion, especially from someone you can trust like friends or family members is important. As little as I trust statistics given that they can often be manipulated to reflect whatever you desire, there’s one that I found to be not only accurate but very telling as well. According to the NRA, 9 out of 10 times being armed with a firearm will prevent a crime without anyone getting shot. The criminal being evil but not stupid will obey its well-honed instincts and go looking for an easier pray. This means that for the person that carries concealed, given a certain amount of awareness and skill handling a firearm, chances are that most likely he will not have to fire his firearm to protect himself. Of course there’s countless variables, some which you control and some that you don’t. Since we can’t do anything about those we don’t control acquiring the skill to use the weapon proficiently, practicing so as to keep that skill, always being mindful of your surroundings and never dropping your guard completely will improve those odds even more. Of the people that I know that train in the use of defensive weapons, either because of their work or their own choice, everyone has had at least one incident where being armed made a difference. Of course there’s sad outcomes as well, but in most cases being armed and knowing what to do has saved lives. When the crime and violence problem becomes serious enough, you’ll find out that you’ll get lots of these “close calls”, incidents where your awareness pays off and you manage to avoid much worse outcomes. These may be anything from would-be attackers turning around and hurrying the other way as soon as they see you draw, or bringing your gun up on them, ready to shoot. In most cases, if you react fast enough they will choose to flee. They have their gun tucked Mexican style or in a pocket concentrated on what they are about to do, the last thing they expect is to stare down the wrong side of a gun, the surprise factor being turned against them. Here yes, seconds are important. Seeing the threat a couple seconds in advance may be the difference between catching them totally by surprise, having them freeze and mumble something incoherent as they walk away, or having to shoot. If you don’t detect the threat in time, guns may already be drawn on you and that leaves you no choice but to shoot. Awareness does pay off. These incidents may become common enough unfortunately. On one side you will want to tell your loved ones about it, at first without even thinking, then you see how scared they get, you tell them because you feel you shouldn’t keep anything from them, that they should know what’s going on out there. Eventually you’ll ask yourself if telling about every little incident helps or just scares them more. Finally you have to be honest with yourself about the situation. There’s just so many times you can dodge the bullet. Sooner or later you’ll make a mistake or simply run out of luck. If the close calls are starting to become too common an occurrence, you should consider relocating to a safer place. Times are changing and places that used to be safe aren’t so any more. I get emails almost daily from people telling me of crimes, murders and violent home invasions in their previously safe communities in the United States. This is starting to happen in the “good’ol towns” were people still leave their doors opened. As for places that already had a problem, its just going to get worse and it may come to a point where you simply will have to make the decision and leave looking for a safer environment. With USA hitting a 50 year poverty record, scenes that used to be common only in Latin countries may eventually become part of the American skyline. As of today there’s 46 million Americans that classify as “poor”, that’s 15% of the population. Of them tens of thousands have no home and live either in their car or tent towns. Tent cities are growing across America from California to Florida. Places like “Dignity Village” in Oregon are becoming more common each day. Watching some of the pictures was a bit of a déjà vu because it reminded me so much of a shanty town I saw grow from its origins, Villa Ingeniero Bunge. The place used to be a two square kilometer empty lot of land in an industrial district of the southern city suburbs. 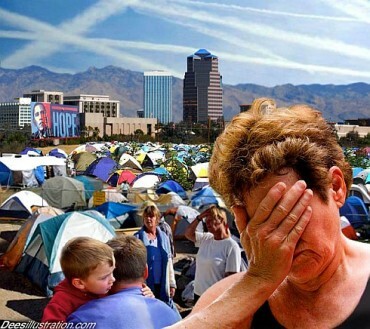 Once the political decision was made and the word got out that it was ok to squat the land, within hours people started showing up setting up tents. By the next day the 2 square kilometers where full of tents. When you drove by after the sun went down you could see the different fires people made to cook and stay warm. A month later most had already starting building shacks with corrugated metal, plywood, plastic sheet and cardboard, the late comers being some of the few still living in tents. They would illegally connect to the electric grid, so you could see thousands of light bulbs all over the area. A year later most people had managed to build brick and mortar structures, just a room or two, and they soon demanded to have sewers and water connections. The fact that they built on floodable ground that was never meant for housing just made conditions more miserable. When the creature that is a shanty town runs out of space to grow, it starts growing vertically, one structure over another up to five floors in some cases. Given that this is all unregulated construction, collapse of buildings are a constant risk and do occur often. Shanty towns and slums such as these grow organically like a disease spreading in the urban grid as far as its allowed to grow. There’s no organization, no planning, just one shack next to another in an endless network of corridors. Why are shanty towns a bad influence? The lefty speech says they are picturesque housing and have the same rights just like anyone else, and that like squatting, shanty towns are part of a country’s culture and folk. Its really not the case. The slums and shanty towns into which this sort of settlement often involves into are wrong since the begging. On principle alone they start as squatted land, land that has been stolen either directly to an individual or the entire population by the squatting of public land. It is true that some good people live there. Especially when its because of an economic crisis some people simply don’t have anywhere else to go. That doesn’t change the fact that who takes over what doesn’t belong to them is standing clearly on one side of the law. Some do it because they have no other choice, many others do it because it’s the easy thing to do and actually prefer to steal rather than working hard to afford an honest living. Its no wonder that in no time criminals control these places even if honest people also live among them. They are dirty, crime infested parts of the city where criminals find shelter and the police don’t dare enter without considerable amount of backup. The labyrinth-like corridors are ideal for criminals to run into and disappear, while for cops the narrow spaces turn it into a potential risk to their lives at every turn. In urbanization terms they are practically impossible to find a solution to, requiring to first remove the buildings so as to set up a water and sewer distribution grid and find some logic organization to it. The impact of a shanty town goes beyond this. It’s a badge of disgrace to any city, turning away tourism and investors. The problems related to the lack of proper sewers and hygiene affect people beyond the borders of the shanty town. The social decadence it implies takes years to undo. As these settlements grow, they grow in population to. The people living them soon start having kids which in no time will need housing of their own. Before you know it you have hundreds of thousands living in these conditions that require proper housing. If a country doesn’t find a solution to its substandard housing it may soon find out that the problem has grown beyond solution, along with its crime problem and negative social and economic impact. Today, thousands are living in these conditions across the United States. If the economic crisis isn’t overcome in the next couple of years and the hosing problem tackled early, you will be seeing this sort of shanty towns and slums spreading and growing like a parasite in no time. Thanks for your blog and book. The book is probably the best primer on what to expect, if we see a crash inour future. It isn’t as ‘pretty’ as many other such books, but much more useful–especially the arguments for stayingin the suburbs–instead of ‘survival retreating’ from Argentina’s eperience. Regarding the video. I agree very much with your choice of the .357 Glock. I also have a #31 Glock and will carry it more when the weather gets colder. I have a Kahr CW9 for warmer weather. I only have (second hand) knowledge of one person shot with a .357 magnum, by a deputy that I knew. The robber simply dropped on the spot and was pronounced ‘DOA’ at the hospital. Somewhere that 125 gr magnum load earned the term ‘trapdoor load’ because a lot of bad guys just dropped straight down like they were falling through a trapdoor with a solid hit from one. The Glock 31 fiully loaded weighs pretty close to the same as my unloaded Glock 20 and is smaller in all of the right places. I reload .357 Sig and can load a box for $12.00, buying once fired cases (in lots of 500) with Hornady or Nosler 124gr JHP’s–both good performers. Gold Dots are much more expensive and raise the cost to $17 per box. If you reload this round I highly recommend the Lee collet crimping die. (Never factor in your per hour labor or you may never reload again). All loads in this ’31 are as accurate as target wad cutters in my Gold Cup .45, except the 124 gr fmj Winchester loads that I can buy at my local Walmart (about $30–last I checked). Hi Mark, I agree with you and that’s why I went with the 357 SIG in the first place. While I dont expect one shot stops with any caliber (hangun or rifle) I know some are better than others and the 357 SIG is clearly one of the most effective ones you can shoot from a handgun. Besides its power there’s also the issue of it being the most accurate mass produced pistol caliber with a flat trajectory as well as the one that will feed best and less likely to jam compared to straight wall cases. Yes, its possible if you hang around knife forums and find tips like these. Does SanRenMu in the province of Guangxi, China mean anything to you? How about Spyderco and their best selling knife, the excellent Tenacious and Resilience which I’ve often recommended? Well, SanRenMu makes those for Spyderco, but they also sell under their own name at a much lower price as well. Its still the same company, they even use the same steel as in the Tenacious, 8Cr13MoV stainless steel. This model is somewhat similar in design to Chris Reeve’s Sebenza with a 2.8″ blade and its framelock system. For 7 bucks plus another seven for shipping you can get one of these from ebay delivered to your door. In this video I answer some questions left on the youtube comments. Guys, if you want to suggest any topics to cover, feel free to leave your comments with suggestions. Love thebook and the blog, thanks for all you do to help get people ready for tough times ahead. I am pretty well along with all of my peeps and supplies etc. I have been thinking about night vision goggles and/or scopes. Admittedly, I love gadgets and NV gear is pretty darn cool. But do you think such items have a valid place in the preppers equipment inventory, and if so can you make any suggestions on how to shop for one that is appropriate? I'd love to hear your opinion on this subject. Hi Eric, night vision can give you a huge strategic advantage during certain situations. People with military experience often mention how important it can be and some of them will make it part of the must-have equipment. Folks here that live in the country and take their security seriously will also make the effort to find and afford night vision gear, which is hard to find and much more expensive than in USA. I wouldn’t consider it must have equipment unless your circumstances make it so. In general terms even if power goes down there’s backup systems, battery operated emergency lights, vehicles. Combined with being responsible about the gear you carry and always making sure you have an LED light with you, you will be able to see and move around with confidence. Now If you are away from the city and within certain isolation, you might want to look into it more seriously. Think about the use you will have for it. Its mostly going to be used for defensive purposes, not wildlife sighting, so you basically have three options. Goggles, monoculars or scopes. These come in all sorts of quality an prices, going up to several thousands for gen4 goggles and monculars to setups costing a couple hundred bucks. In this filed, you usually get what you pay for so don’t expect the latest tec to be cheap. For those that need it but can’t drop several grand on NV Yukon is making a pretty acceptable product. Again, don’t expect it to be the same a goggles costing several grand, but the reviews in their products are very good. If I had to get NV due to my situation within a limited budget, I’d go for their headmount monocular kit. If your terrain makes it possible that you may need to defend your home from attacks further away, then a night vision rifle scope may be waht you need. Given that this is rarely the case, Id take the moncular head kit. Most of the skills you recommend to your readers are good life skills that all people should have to enhance the chances of daily survival, even under normal circumstances. That said, constant, extreme vigilance is not anymore practical than having Uncle Bob come over and help me guard my house 24/7 WTSHTF. While I am raising my children to be watchful and vigilant, there is a whole different level of vigilance I would apply if I lived during a triggering event like a currency collapse. For example, I let them play outside with their friends in the neighborhood without adult supervision. To disallow that would be unhealthy to their development, and the threat to their safety at the moment is not extreme. If the dollar were worthless and crime rampant as you have described in your book, there is no way I’d let them outside without an adult. An economic collapse in many ways is similar to the decline of an empire regarding how complex it is to prepare for it. Unlike defined disasters, natural ones like Katrina or man-made, there’s no clear beginning to it. It is a complex, multilevel event that in some aspects may have a clear trigger or milestone (such as defaulting or bank holydays) but on other aspects it may have been cooking slowly through inflation and unemployment for months, even years. Certain economic events may be easy to pinpoint, but how does unemployment affect people, when will this cause an increase in crime, or affect me directly leaving me without income? When will crime stop being only a factor related to the harsh economy and also be influenced in terms of how violent it becomes due to social hatred because of social polarization? Then there’s also the consideration that it may have been affecting people in different ways based on socioeconomic level and location in the country. Calling such a situation complex is an understatement. Given such complexity and all the variables impossible to ponder, all you can do is stay informed, learn to tell the different signs and know how to interpret them so as to know what the future holds within a certain margin of error. Things to look for would be unemployment, rumors from people within the banking and financial world (some of those rumors saved people millions when our economy collapsed) crime and what type of crime is taking place, corruption, debt and inflation. You must also become pretty skeptic regarding the information the main stream media provides. Who OWNS such media channel? Who are their sponsors and advertisers? What political agenda do they have or slightly tend to favor? If the media says the economy is doing wonderful but people on the street are barely getting by and you see more industries moving abroad, do have your doubts. All these events and signs do tell you something. Don’t wait for the official SHTF day, in socioeconomic terms that simply will never happen, you will simply look back one day and realize the world around you has already changed. That is indeed how people will be taken by surprise. People sometimes talk about rule of law and no rule of law times, as if it were an on/off switch. One day everything is fine but the next week, ups! No ROL folks, so its madness out there, I’ll wear my MOLLE vest with armor plate to work and leave my Keltec 32. In the safe and pick my 1911 instead. Carried in a drop leg holster or attached to my vest of course. People that think this way are the ones that will indeed fail at protecting their families today, ROL or no ROL. If you suffer a violent home invasion in an upper class neighborhood like the Petite family did, does it really matter if some nutcase declared that ROL is still in effect, or that it isn’t? Preparedness is now folks. Modern survival is the way you analyze events, make decisions and ultimately live your life from day one, not after an event. In states where its legal to carry, I would get my CCW permit and carry today. Doing so wont bring any disadvantages to my lifestyle. My kids playing in the street with friends unsupervised? I´d be honest with myself. Can my son defend himself from a social predator? I wouldn’t leave a 10 year old kid unsupervised no matter where I live. How about 13 or 14 years old, and the general area you live in being pretty safe? Then I might be a bit more flexible. Unemployment: If unemployment is over 15-20% there will soon be serious social changes involving desperate people. Poverty: Are half the people around you poor and looking your way with resentment? In Argentina the numbers are still pretty bad. 50% poor and 25% below the poverty line. Of the remaining 25% only 3% make enough money to life a life standard similar in quality to what middle class Americans are used to. Watch out for poverty and not only what the newspaper says or what the president announces. Do you see more people begging on the streets, more dumpster divers? How about shanty towns or tent towns? If you have any of those close keep an eye on your kids, your property and yourself. Inflation: Right now Argentina ranks at the top 3 worst inflation in the planet. That’s a sign of bad times to come. We have unions forcing higher wages that chase after ever increasing prices and still losing millions keeping an artificial exchange rate with the dollar around 1 to 4,2. When the peso devaluates again, I wouldn’t be surprised to see it go to 7 or 8 pesos per dollar. Rising inflation is perhaps one of the final stages before the collapse, and something Americans should pay special attention to. Businesses and Infrastructure: Are roads being repaired, parks kept tended to? Do you see a general sense of decay in the overall infrastructure? Neighbors keeping their houses well kept are a sign of good times. When the economy collapsed here in 2001 middle class people wouldn’t even buy a can of paint let alone remodel, and it showed. Things like stores closing and going out of business, shops boarded up, sometimes being replaced with cheapo discount stores. Crime and Rumors: Crime will be a clear indication of you having to go from yellow to orange in terms of awareness. Now, it may not appear on the media as much as it should and negative news may be avoided entirely by news groups trying to be “team players” with the government. You on the other hand cannot afford the pink shaded glasses. Pay special attention to the local gossip and rumors, and when something catches your attention try verifying through other sources. Who got mugged, robbed or suffered a home invasion. Don’t wait too long. Once you know this is happening in your general area take the extra precautions you know you must take. You can still have a pretty normal and happy life in spite of being forced to be more cautions and more aware given the circumstances. I believe its much better to take those measures while still enjoying the things I can, than taking the easy road and not doing it, and maybe one day regret it. Sights are the only part worth replacing in a standard Glock pistol. Fumbling with other parts isn’t just unnecessary, it often leads to malfunctions. You know what they say about fixing that which is not broken. Also, sights are the weak point in the Glock due to being made of plastic and relatively fragile. During torture tests where Glocks are put through hell, the part that often breaks and does so before all others are the sights. Throw a Glock form a plane or car driving at 80 mph? No problem, but the front sight is likely to pop off. To make it indeed perfect you need steel sights, and the tritium inserts are a nice addition too. Don’t go for sloped snag-free rear sights, go for square ones. It’s quite important for the rear sight to snag on your belt or clothing during single handed reloading and failure resolution drills. 2) Put together the tools needed. Hammer, needle pliers, front sight Glock tool, alcohol, paper, vice or c-clamp, fine sandpaper, Loctite, mechanic pencil, ruler, plastic punch and a table to work. 3) If your sights are on target, then mark with the pencil their exact center in the pistol frame. This will be used as reference later so as to make centering the new sights easier. Use a fine mechanic pencil for greater precision. 4) Make another mark in the sights you are about to install in their exact center. This mark will be aligned with the one in the frame. 5) Remove the existing sights. In 3rd gen Glocks and older you just pull the front sight out easily with pliers. In the Gen4 they have a small hexagonal screw that requires the front sight Glock tool or fine needle point pliers. Use a vise or C-clamp with some paper so as to not scratch the frame and using a punch and light hammer taps remove the rear sight. I found that it came off easier in the older models. The gen4 requires some intense hammering that destroyed the plastic rear sight. 6)Use alcohol and tissue paper to clean the surface where the new sights will be installed, make sure there’s no oil left. Carfeful not to remove the pencil marks. 7) Apply a drop of Loctite in the contact surface and install the front sight. Make sure the pencil marks are aligned before tightening the screw. 8)Test the rear sight, if it doesn’t slide in with a bit of hand pressure, place the sandpaper on a flat surface. Firmly holding the rear sight with its bottom against the sand paper slide it back and forth, then left and right five times. Try sliding it again into place. Repeat this process until it slides snuggly into place with hand pressure alone. Dont rush it, and don’t overdo the sandpaper or it will fit too loose. 9) Once it slides into place, remove it, clean the area again with alcohol, let it dry, then add a drop of Loctite and slide until the two marks align. 10) Let the Loctite dry according to the product’s instructions before using. Usually 24 hs will do. Wipe clean any product that may have been smeared in the slide and you’re done. First and foremost, thank you for taking your precious time to share your experiences through this blog. The information here is by far the best, at least in my humble opinion, in regards to real and no-kidding modern survivalism. I am so sick of the wanna-be commandos, the EOTWAWKI preachers, and the zombie hunters. Your book reflects the crude reality; which may be something new for some folks. Personally, born and raised in a latin culture (Puerto Rico), it all sounds very familiar (with the exception of a full economic collapse, of course). We are very lucky to be a U.S. Territory; I really can’t imagine our little island being run without the oversight of Uncle Sam. As it is, the monkeys that try to run the island (our politicians) are extremely corrupt that even with millions of USD provided to us and all the freaking taxes the government of Puerto Rico takes from us, our roads are as crappy as the surface of the moon, our education programs are unfit, our government services are by far third-worldly, crime is rampant (drugs, murders, robberies, car-jacks, home invasions), unemployment up the roof… The sad thing is that we are used to this; it’s our accepted lifestyle… Gee, what would happen if the U.S. decides not to babysit us anymore? Gracias, Fernando. I’ve been prepping for a few years now, out of common sense. My wife told me that I was crazy, especially when I started coming home with guns, ammo, and a shitload of canned food. I guess I’m not the only one!! I wish I could’ve read your book a long time ago. It’s a very good book. Barbarita’s story really broke my heart. I have kids myself; a 6 year old daughter and a 1 year old boy (will be 2 in October). I don’t ever want them to suffer hunger like Barbarita did. I also wish my Rockerfeller wanna-be neighbors read and digest your words of wisdom. You wouldn’t believe how many of my idiot neighbors rather spend $6,000 USD on a beautiful garden, than investing on a water cistern, or security doors, or having a gun for home defense. Let me tell you, we just got hit by tropical storm Irene (a storm; not a hurricane) and people were not ready. Stores and markets were packed by people doing last minute purchases; goods were running out in a matter of hours. Gas stations were packed before and after the event… Many stations were dry in no time. The power and water services were shutdown; and people were going nuts! Have you seen people fighting for ice, a galon of water, etc? Many of my neighbors can’t cook since they rely on electric stoves and microwaves and don’t have a gas grill as a back up. Again, this was just a storm that had no significant damage to our infrastructures… Imaging something bigger and how people would react! Out of curiosity, how is the mail working in Argentina after the collapse? Do they confiscate the items they send you? Thank you for your words of encouragement. Sorry for the delay in replying, sometimes its hard to keep up with everything and email piles up quickly. In the last few years survival and preparedness has gained much more notoriety and its becoming more accepted. The media has a lot to do with this, seems you can’t throw a dead cat without hitting a survival show of some sort. While it’s good that people are getting used to words such as “survivalist” that used to have a more negative connotation, on the downside the media has to make sure before anything else that it keeps a healthy amount of raiting so as to survive itself. This means that what you see on TV must be entertainment before anything else, and only after that can actual information be added to it. Documentaries are a bit more informative but reality TV shows need a fair amount of visual impact and pace so as to be digested by the mass viewer. So now we have preppers and survivalist all over the place, but when it comes down to it, are you simply begin entertained, or are you learning things that you can actually put to use? Thanks do Bear Grylls I now know that I can hydrate by squeezing elephant poo but somehow that’s not helping me a whole lot. That’s how on one hand you have a guy sitting in a couch “learning” how to survive in the Siberian wilderness but at the same time he hasn’t got a few cases of water in foresight of the next storm or hurricane which he will most certainly have to go through. In spite of preparedness and survivalism hitting the main media, the vast majority of people still don’t get it. They don’t understand the life changes involved, the new set of priorities they should have because as the different social safety nets start failing the future in USA or anywhere else will not be nearly as forgiving as it used to be for a long time. You’d think people would know that there’s always going to be another tornado or big storm, that there’s the possibility of flooding in certain areas, yet as you noted they will wait until the last minute to rush to the supermarket. For people used to living in first world countries, the impact will certainly be greater. They are used to a system that works, while in the third world you already don’t expect much from the authorities. You learn to make your own retirement (the government here just steals your retirement plan) you learn that water or power may be cut off for days and no one is really surprised when it happens. Floods? Evacuate yourself buddy, no one’s coming to help you. If they do, its mostly neighbors and ordinary people. I remember during the Santa Fe flood of 2003, the help was only in the form of people’s donations. What did the local authorities do? They “helped” once the donations reached the disaster area by locking them up in warehouses and SELLING the donations to the people that lost their homes afterwards. At least around here, every guy knows how to cook with charcoal or wood and of course, start a fire. Every self-respecting Argentine is expected to know how to cook an “asado” and prepare meat and offal (intestines, kidneys, etc) . Instead of firing up the BBQ , people here can cook with any wood they come by. I knew a guy that actually preferred pallet wood for his asados, go figure. In the end, what does it mean to be a survivalist or prepper? I still find it hard to define completely. What we all have in common is that we foresee the possibility of problems and disruptions down the road, and take the necessary steps to be ready for it. But more than that, its also about a way of living, heavily inclined towards practicality, appreciative of freedom and individuality. It’s not only about being ready but ensuring a quality of life and way of living. Some people consider that the difference between self-claimed preppers and survivalists is that preppers are “lite” versions that get ready for emergencies and disasters but do it in a way that doesn’t involve any significant changes in their lifestyle. In some cases people define themselves as preppers because they have a bug out bag, and a Rubbermaid with a few supplies. It seems to me that when someone defines himself as survivalist he’s generally more committed. The difference isn’t because of the amount of stuff one or the other has, but the mindset involved generally speaking. At the same time some people that call themselves survivalists do fall into that preconceived and much stigmatized version which involved individuals with “issues” and certain detachment from reality. This is yet another example where you have to deal with people on a per case basis and survivalist, prepper or whatever they choose to call themselves aren’t a clear indication of what type of person you’re dealing with. About your question, yes mail here is working much better than it used to and shipments dont get…err.. “lost” as much as they did. This may be due to the 50% tax on the items (plush the shipment cost) they are now applying. Usually there’s no problem receiving shipments, but unless its pretty small like a folding knife or some other small box, you’ll have to go pick it up at customs and pay the 50% tax over its value. Small items and envelopes are more likely to pass unnoticed. Take care and again, thanks for your email.